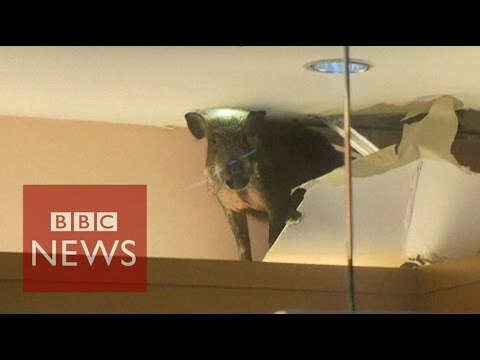 In an absurd turn of events, a wild boar fell through the ceiling of Kingkow, a children’s clothing store in one of Hong Kong’s shopping malls. The incident occurred in May 2015 and led to a standoff between the boar and the authorities for around four hours. This boar seems to have escaped the forest area and found itself in the Chai Wan Shopping Mall in Heng Fa Chuen, Hong Kong. This was the second story of the day of a wild boar on the lose, as another boar, weighing about 40 kg, had been spotted in a pool at Tsuen Wan Park. The one in the pool was returned back to the forest by animal control officers. The boar in the mall was first noticed at around 6:30 p.m. Later, it was spotted entering Kingkaw through the ceiling. It appears that the boar, a young female weighing around 25 kg, entered the ceiling of the shop by climbing up a ladder present in the shop’s backroom. The boar was easily able to punch her way out of the false ceiling and eventually fell to the floor. However, the boar got trapped inside the store and was found running around to find her way out. She also knocked over some child-sized mannequins. There were 10 police officers present at the site to contain the situation, and a vet was finally able to inject the boar with a tranquilizer. Once the matter was under control, the boar was transported to an animal and wildlife observation center. It seems that such a situation is not new to Hong Kong, as there are many wild boars that roam about the countryside freely. They can get rather large, up to 6.6 feet in length, and can weigh up to 200 kg. These wild boars tend to get quite aggressive, especially if they feel threatened. That’s probably why it took the officers at the mall four hours to control the situation. According to the South China Morning Post, officers have advised anyone in such a situation “to stay out of their [the wild boar’s] way, avoid provoking them, and if necessary, hide behind a tree.” If you are in a mall, find another shop! The post A Wild Boar’s Day Out appeared first on Vision Times.